WPW055764 WALES (1937). 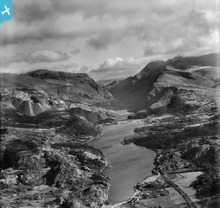 Distant view of Llanberis showing lake and mountains, oblique aerial view. 5"x4" black and white glass plate negative. 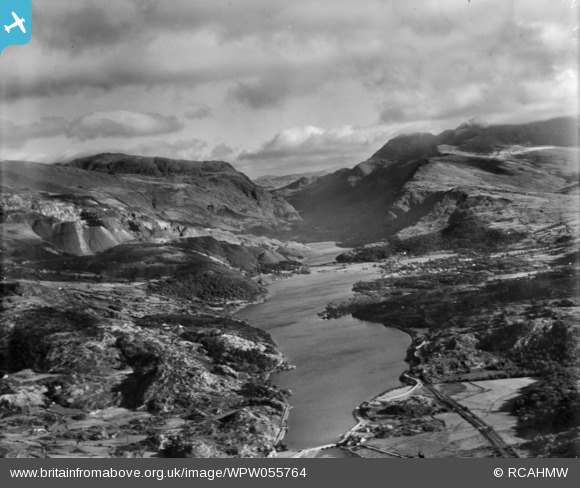 Title [WPW055764] Distant view of Llanberis showing lake and mountains, oblique aerial view. 5"x4" black and white glass plate negative. I was born in the village of Dinorwic adjacent to the quarries during WW2. The cottage had no electricity and no indoor running water althought there was a tap in the garden and a chemical toilet outside. Classic North Wales in sunshine and the clouds just dusting the tops, good contrast and detail. The horizon is off kilter which puts you in mind of the biplane banking round.